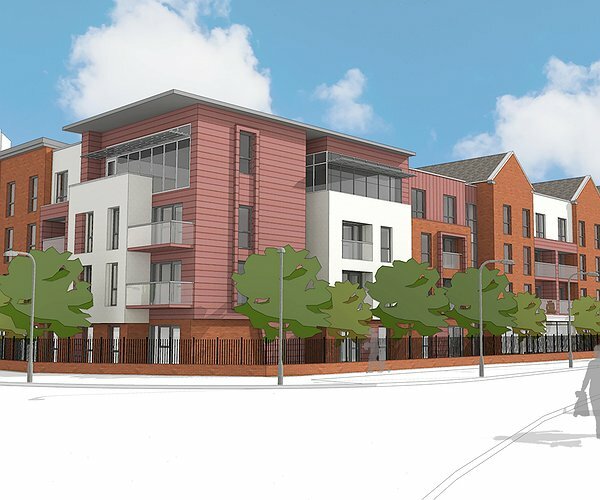 The extra care scheme currently under construction in Flint town centre includes 73 one and two-bedroom apartments for local people aged 60 and over, subject to eligibility criteria. The drop-in sessions will be held at the Jade Jones Pavilion on Fridays in June from 9.30am to 4 pm when, as well as finding out more about the scheme, visitors can also make arrangements to view the show apartment. Llys Raddington is a partnership development between Flintshire County Council, the Welsh Government and Tŷ Glas Housing Society, part of the Pennaf Housing Group. When completed the scheme will be managed by Clwyd Alyn Housing Association, which is also part of the Pennaf Group, and individual domiciliary care support will be provided by the Local Authority. “We’ve already had a great response and lots of interest in the new apartments and the drop-in sessions are a great way to find out if one of these apartments might be the ideal choice either for yourself or a family member,” said Steve Robinson, Extra Care Services Manager. “The scheme is specifically designed so that people with a wide range of support needs can live independently and enjoy a good quality of life, whether they just need a little extra support or more complex domiciliary care assistance,” added Steve. Clwyd Alyn are also currently advertising for staff at the scheme. There are vacancies for a cook plus three domestic assistants and three catering assistants. The closing date for the vacancies is June 17 and full details are available on the Pennaf Housing Group website: www.recruitment.pennafgroup.co.uk. They will be holding a separate recruitment drop-in event at Flint Jobcentre on Friday June 8 between 9am and 12.30pm for those who are interested in the roles. "‘Knit and natter’ group at café"